In the 21st century, surgery can be performed painlessly on a patient through the use of anesthesia. While the use of anesthesia prevents a patient from enduring the pain of surgery, it also comes with considerable risks. When an anesthesia error occurs, the victim can suffer serious, even fatal, injuries. If you think you or a loved one has been the victim of an anesthesia error, you may be entitled to compensation for the injuries or loss you have suffered. Prior to the 1800s, anyone who had to undergo a surgical procedure did not have many good pain-relief options. People often resorted to entering an alcohol- or opium-induced stupor when faced with a surgical procedure. Today, doctors use anesthesia to manage pain and reduce anxiety for everything from pulling a tooth to open-heart surgery. There are actually a number of different types of anesthesia that range in intensity level from local anesthesia to general anesthesia. Local anesthesia simply numbs an area that a doctor will be working on, such as a cut that requires stitches. Drugs such as lidocaine, tetracaine, or novocaine are usually used for local anesthesia. Similar to local anesthesia, regional anesthesia numbs a larger area, such as an entire leg. This type of anesthesia blocks a single nerve or a bundle of nerves and is often used during childbirth in the form of an epidural. A more intense level of anesthesia is known as “twilight sleep” or “procedural sedation.” During procedural sedation, a patient is awake and able to respond to questions. However, he or she will feel no pain and may not remember anything about the procedure. The same drugs used for general anesthesia are typically used for procedural sedation but in smaller doses. A sedative such as ketamine or nitrous oxide, which depresses the central nervous system, is a common choice. A dissociative drug, such as diazepam or midazolam, which keeps nerve sensations from reaching the brain, may also be used. An analgesic, such as fentanyl, will be used for pain relief under procedural sedation. 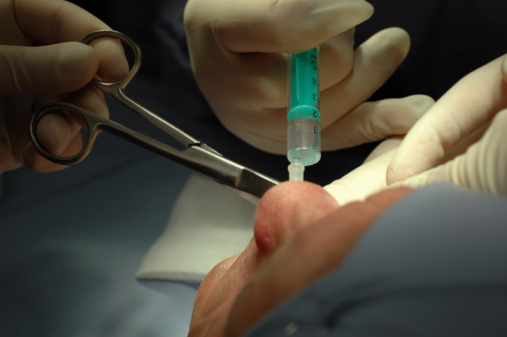 General anesthesia is used for longer surgical procedures that usually last an hour or longer. Under general anesthesia, the patient is completely “out” and is unable to respond to questions or feel any pain. The patient will not remember anything about the procedure. A patient under general anesthesia must be very carefully monitored, as many of the body’s automatic functions, such as breathing, do not work properly when a patient is fully anesthetized. What Is an Anesthesia Error? All types of anesthesia come with inherent risks. However, the deeper the sedation, the higher the risk of serious, even fatal, complications. Defect in medical equipment used to administer or monitor patient. Anesthesia errors are among the most common types of medical errors. According to the National Healthcare Quality Report, there are 0.724 anesthesia complications per 1,000 surgical discharges in the United States. Estimates place the number of fatalities caused by an anesthesia error at one in every 200,000 to 300,000 patients. What Type of Injuries Are Caused by Anesthesia Errors? If you believe that a Texas medical professional’s anesthesia error caused you to suffer injuries or caused the loss of a loved one, you may be entitled to compensation. Texas law provides for compensation for both economic and non-economic damages for victims of an anesthesia error. However, there are caps that set the maximum allowable amount of compensation in some cases. Economic damages are things such as medical bills incurred because of the error or lost earnings that stem from the anesthesia error. Non-economic damages are aimed at compensating a victim for the emotional trauma caused by the error. If an anesthesia error caused a death, the surviving family members may be entitled to compensation for the loss caused by the error. Although the law provides a mechanism to compensate victims of medical malpractice, the law also limits the amount of time within which a victim can file a lawsuit for those injuries. In order to preserve your right to compensation, get help from an experienced Texas anesthesia error attorney as soon as you suspect that an error was committed. Contact The Law Office of Kevin Krist today for your free consultation by calling 281-677-3962 or by using our online contact form. We represent medical malpractice victims on a contingency fee basis, which means you pay no fees unless we recover compensation on your claim.